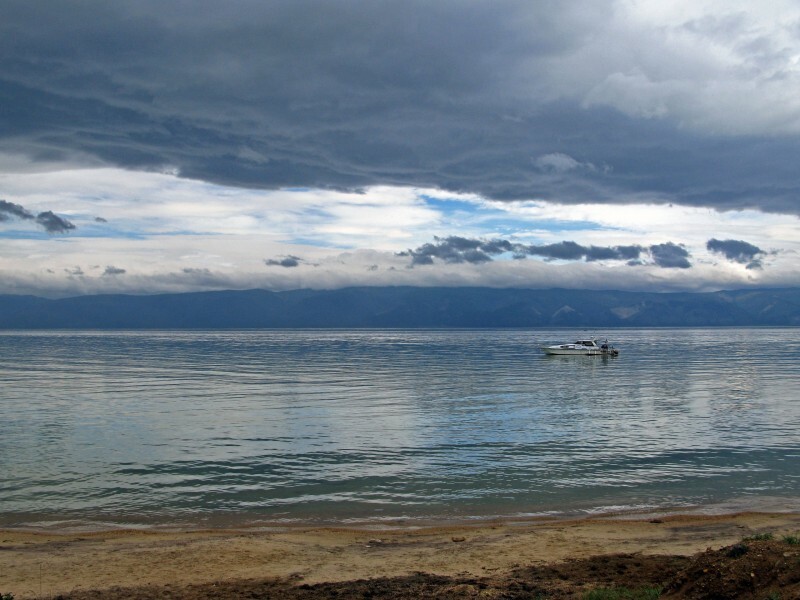 Barguzinsky Bay refers to the territory of the Trans-Baikal National Park, located in the Republic of Buryatia. Its area is 700 sq. Km. It begins with the Cross of the Cape in the middle of the eastern shore of Lake Baikal. The taiga unique coast of the bay passes into the sandy, through 40 km, being interrupted by the Barguzin River, from which the sandy spit stretches for 22 km, resting against the mountain range of the Holy Nose Peninsula. The sandy spit connects the mainland with the peninsula Holy Nose - this is a rare geological formation for Lake Baikal, because of which the island becomes a peninsula or a cape. After the surf zone, the spit turns into picturesque dunes covered with larch and pine forests. The uniqueness of the sandy zone of the coast of the Barguzinsky Bay is coastal ramparts. They were formed due to the gradual movement of the coastline deep into the bay and the slow but steady flow of solid precipitation. Shafts stretch at an acute angle to the shore of the bay, in the direction of the mouth of the Barguzin River. To the northeast, beyond the sandy spit, there is the swampy isthmus Soft Carga, it shares the Barguzinsky Bay with Chivyrkuisky. Scientists suggest that the Barguzinsky Bay was formed as a result of the rapid lowering of a large stretch of land, confirming the existence of submarine canyon-like extensions of the valleys of the Maksimikha and Barguzin rivers. Despite the shallow depth near the sandy spit, the Barguzinsky Bay should not be called shallow water. Its depth increases from the distance from the coast and reaches the mark of 1284 meters; it is only 350 meters less than the maximum depth of Lake Baikal. In the summer, when there is a quiet and warm weather, the water here warms up to quite normal temperatures. And especially the warm water temperature, reaching 22 degrees, where the sand spit of the bay connects with the Holy Nose Peninsula. The name of this place is Kultuk Bay. In the summer, a large number of holidaymakers accumulate here, coming here, mainly by cars and route buses coming from the city of Ulan-Ude and other Baikal areas. You can stop in the area "Maksimikha" - here is the largest southern bay of the Barguzinsky Bay. The water in the bay is warmer than in other bays of the lake, and beautiful sandy beaches. From Maximiha organized trips to the lake Shantalyk and Dukhovoe. The most attractive places for recreation are - on the eastern shore of the gulf (Ust-Barguzin) and on the southern (at Maximikha) - between which 40 km. where a lot of pebble and sandy beaches, and the water in the coils warms up to 22 degrees. The mountainous southern and northern shores are most picturesque in winter, because it is here that grottoes of rocky shores are overgrown with ice caves and you can see the hummocks fields on Lake Baikal. The northern part of the Holy Nose is perfect for horseback riding and active hiking. You can see all the beauties of the Barguzinsky Bay, sitting in the guest houses of the villages of Barguzin, Ust-Barguzin, Zorino.